This tip is directed at everyone who has a job where a 401(k)/403(b)/other individual retirement savings plan is available, but you’ve not yet signed up for it out of laziness, forgetfulness, or some other non-retirement-based reason. This tip is doubly directed at everyone whose employer offers matching money for that retirement plan and they’re not signed up for it. Let’s be realistic here. If you’re under the age of about 50 or so, you’re playing a fairly dangerous game in assuming that Social Security in anything close to its current form will be there for you when you hit retirement age. Most likely, the money will be a pittance and not nearly enough to survive on. There’s some chance that there will be nothing at all. Don’t rely on that pension, either. Companies go under – even governments go under. Many look for ways to get out from under the financial burden of paying out that pension they’ve promised to their employees, and many get away with it. The only retirement tool I believe in is one’s own savings for retirement, and that’s where a 401(k) (or similar plan) comes in. 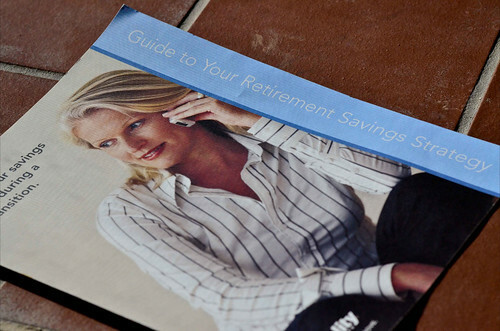 For most people, a 401(k) is the absolute easiest way to get started saving for retirement. In many workplaces, you just fill out a form, they take a little money out of each of your paychecks, and you’re saving for retirement. Not only that, the money taken out of your checks isn’t very painful at all. If they take out $20, it likely only drops your take-home pay by $16 or so because the money is taken out before taxes are calculated. Even more importantly, some employers offer free money into your 401(k) if you put money in yourself. Let’s say your employer offers a one-for-one match. If you sign up to put in $20 per paycheck, your paycheck only goes down $16, you put $20 into your account and your employer puts $20 into your account. That’s free money, and if you’re not signed up for it, you’re saying no to that free cash. Some people stress out about the investment choices. Don’t. Even if you make a really poor choice among the investment plans offered, you’re still far better off putting money in there than you are not putting anything in at all. Saving money in a terrible investment is much better than saving nothing. You’re better off just picking a plan at random than you are putting it off another paycheck. That’s not to say you shouldn’t look at the investments and try to figure out the best one. The thing is, you can do that later. You can change investments later on without much difficulty at all if you decide you’d rather be in something else. The only difference is that if you start saving for retirement now, you’ll actually have money in there to move. Of all of the financial mistakes I made in my early life, the one I didn’t make was putting money away for retirement. I saw the challenges my parents were having as they neared retirement and I didn’t want to have that kind of difficulty. I put in quite a lot, and I’ve never really stopped. Looking back on it, I realize that I would have had bigger paychecks had I not put that money away, but I know full well that if I had bigger paychecks back then, I would have just spent the money on things I didn’t need. You won’t miss the small amount that’s gone from every paycheck, but a few decades down the road, you certainly will miss not having hundreds of thousands of dollars in retirement saved if you don’t make this move today. Just do it.